El Malpais National Monument - Super Inky! I loved visiting Chaco Canyon, but it's not the only national park in New Mexico. After resting for a day and exploring Albuquerque, I headed out to El Malpais National Monument, near Grants, New Mexico. 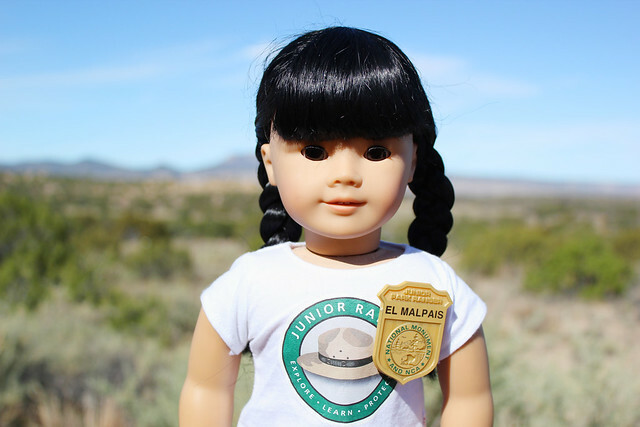 I had decided to earn a Junior Ranger badge there. 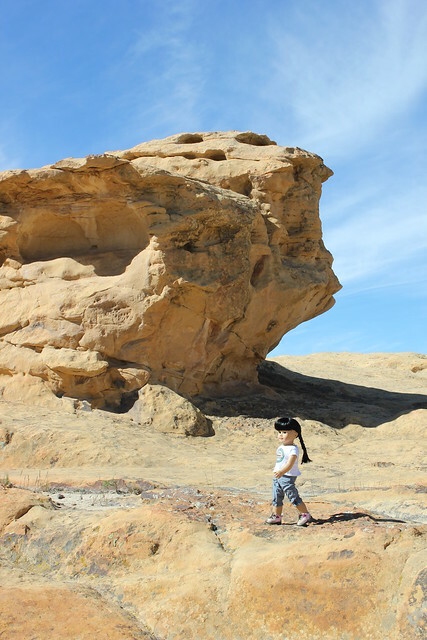 To start, we headed to Sandstone Bluffs. In this photo, I'm up on the bluff looking down over the lava flows below. Many, many years ago, volcanoes in this area spewed big rivers of lava all over the land. Now, the lava has dried to black rock and you can climb on it if you're careful. At Sandstone Bluffs, there are beautiful little depressions in the rock. They're called tinajas. I peeked into one and it was full of tadpoles! When it rains, the tinajas fill with water and become tiny water ecosystems. 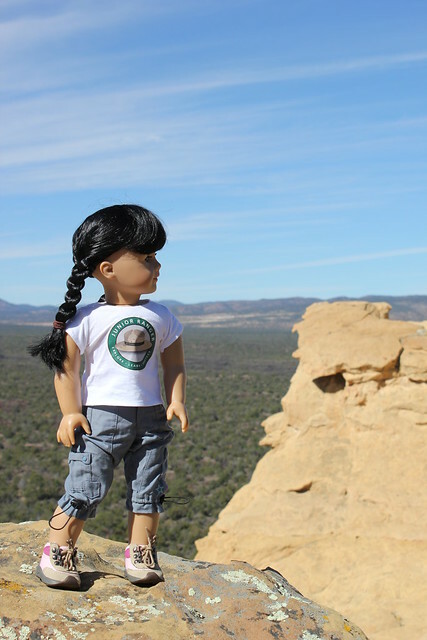 The Sandstone Bluffs are rocky and beautiful- they look like a moonscape. Actually, they reminded me of my trip to Canyonlands National Park a few years ago. Both are great places to pretend to be a cosmonaut. 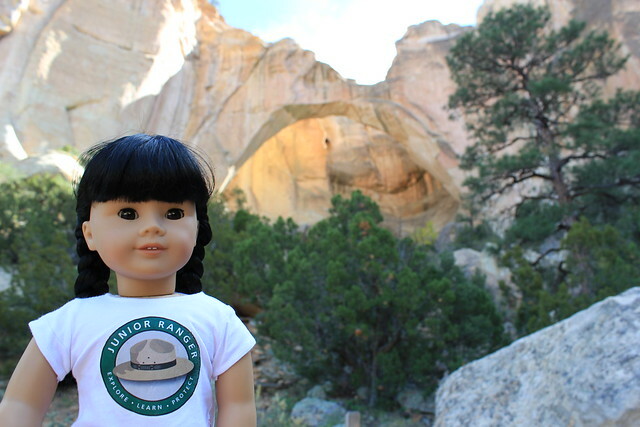 After the Sandstone Bluffs, we stopped by La Ventana Arch. My friends in Utah will probably think it's not too impressive, but I was happy to find it all the same. The arch was slowly carved out by wind and water over geologic time. Awesome! 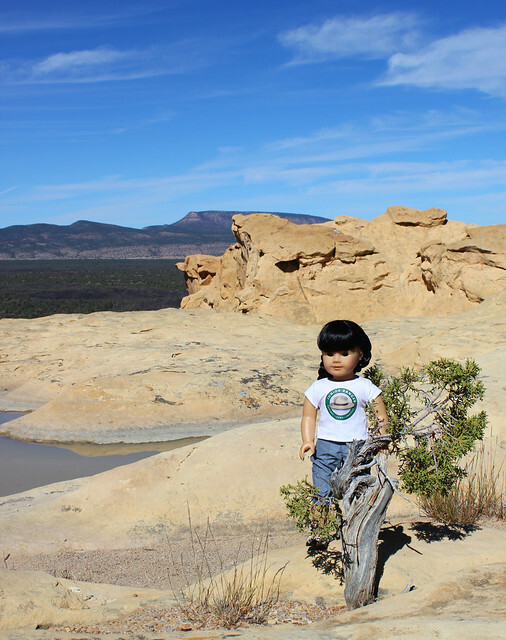 Finally, we stopped by the ranger station so that I could turn in my workbook and earn my second New Mexican Junior Ranger badge. El Malpais is a beautiful park! I want to come back someday and explore the lava tube caves. Sadly, they were closed this year because the bats that live in the caves have a disease which humans spread. So that was my trip to New Mexico- one cultural park and one natural park! This weekend, in honor of our nation's veterans, all National Parks will have free admission. If you've never explored one before, this is a great opportunity. P.S. It's November, a special month for me! Does anyone remember why? November is your birth month! It's easy for me to remember your birthdate since its the same day as Miley Cyrus's. I know you're not one for Miley, though. I hope your birthday is great, regardless! What a beautiful place to visit! Thanks for sharing photos! Wow, Inky, I love your photos, especially the first one of you on the bluff! It's beautiful! Looks like you had a wonderful New Mexico trip. I hope I can visit those cool parks someday! Awesome pictures! That looks like a fun place to visit! It's so cool that you've had so many adventures and traveled so many places. Awesome photo's Inky .. looks like you are having tons of fun in New Mexico and earning great badges too .. how kewl ..
We are going to be in New York in April .. maybe we can meet up. Thank you all for your compliments! I was really lucky to get to travel to New Mexico this fall. Taryn, I'd love to meet you when you come to New York this spring! Where did you get those adorable hiking boots? I love them. My hiking boots are from the 2007 American Girl Adventure Outfit. It's retired now, but you can probably find it on eBay.